Lotto Annihilator – Scam By Richard Lustig? 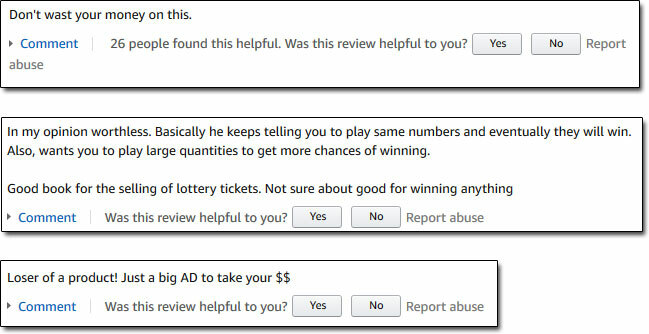 Review Uncovers Why You Won’t Win! But is their really a proven way to win the lottery like Richard Lustig claims or is the Lotto Annihilator just a scam that he’s put together to milk his 7-time wins & continue to make even more money at the expense of others? What Exactly Is The Lotto Annihilator Program? So first thing’s first, Richard Lustig the man behind the whole thing is a 7-time lottery winner & essentially as opposed to claiming that it was “mere luck” he’s come out & claimed that he’s got a special method for winning the lottery which he’s allegedly releasing via his newly launched Lotto Annihilator program. One of the things that makes me say that is because he’s charging a whopping $97 for people to access his program, so he’s clearly set out to make money from it… And now if he wants to make money then why doesn’t he – you know, just win the lottery again? If his method’s truly so proven & guaranteed then surely he doesn’t need to waste time launching businesses or selling products – surely he could just continue winning the lottery if he’s so great at it. This alone makes me very sceptical, but what also makes me very sceptical is that he keeps launching his lotto programs under various different names. I previously reviewed one of his programs when it was called Lottery Winner University & before that I seen it kicking about under the name of Lotto Crusher. So with that being said it’s hard to trust any make-money related product sold via ClickBank, especially one that makes extraordinary bold claims (like being able to provide a guaranteed way to win the lottery). But alongside that issue there’s also another issue, which is that ClickBank is a network geared towards affiliate promotions – so basically product owners list their products & affiliates promote them online in return for commissions. So ask yourself this – if Richard Lustig’s Lotto Annihilator program really works, then why is Richard paying people to promote it – and why are these people wasting their time promoting it? Surely instead of trying to promote it & trying to get people to buy it to earn commissions if it truly worked as promised you would simply sign up to yourself & you know, win the lottery like Richard claims you will. But whilst I’m on the topic of affiliate promotions – if you want to check out how I was able to generate an income of $10k/mo from a simple affiliate promotion method then be sure to check out this page here. That sure as heck doesn’t sound good, does it? In my opinion that’s basically saying that everything you’re told on the website is just a lie or “a big joke” and that if you hand over your cash to find out more you’re not really going to be getting access to any legit method as promised after all. In my opinion it seems like Richard’s just got really lucky, won various lotteries a bunch of times and then thought to himself “how can I milk all these wins to make more money“… And then he’s come up with his Lotto Annihilator idea. As opposed to truly helping you come up with any sort of legitimate method to win the lottery it seems as far as I’m concerned that he’s just more interested in cashing in himself at your expense instead. I mean don’t get me wrong there are “tricks” to give you better (slim) chances of winning the lottery – like figuring out how many tickets you would play in a lifetime & play them all in one game (but never playing again) – however there are NO proven ways to win the lottery… That’s why it’s named the lottery! My Verdict – Is The Lotto Annihilator a Scam? Well I guess it’s technically not really a scam as such but in the same breath if you do buy into the Lotto Annihilator program in my opinion you’ll likely find yourself disappointed & it’s safe to say that you’re probably not going to go on to win the lottery as a result. So whilst it might seem great on the surface that he won the lottery 7 times, he may have potentially spent more than he ever actually made – therefore in hindsight the whole thing doesn’t appear to be so great after all. But regardless there is simply no way I would ever advocate chasing money through the lottery or any other form of gambling – instead I would advise you just check out a legitimate & proven way to make good money, several of which you can find here on my top picks page. Elevated Legacy Review – New Scam or Legit Place To Start Your Online Biz? DNA Wealth Blueprint Review – The Truth! 2 Responses to "Lotto Annihilator – Scam By Richard Lustig? Review Uncovers Why You Won’t Win!" Great reviews. It is so logical that I cannot help it but agree with you.